A bold statement and a step in the right direction. With Oionos, Italy’s The Foreshadowing delivered a well-rendered but repetitive portrait of doom. The follow-up, Second World, is a broader, richer recording that tells a better story and conveys a better experience overall. 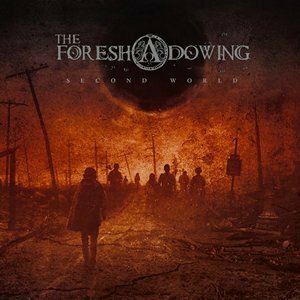 Between Oionos and Second World, The Foreshadowing remained largely the same with the exception of the departure of bassist Davide Pesola and the arrival of his replacement Francesco Giulianelli. Vocalist Marco Benevento, guitarists Alessandro Pace and Andrea Chiodetti, keyboardist Francesco Sosto, and drummer Jonah Padella still commit fully to the shadows and gloom. If Oionos is an omen, Second World is the transition from one desolate universe to another slightly less desolate universe. The songs very nearly express the sunshine of The Foreshadowing’s lost apocalypse, with keyboards springing up to add ambiance and the use of more chanting, bells and mystical effects helping plant a subtly spiritual core. Benevento’s vocals encroach like a besmirched monk adhering to waning faith and clinging to sinister memories, while the rest of the band provides cover. It is into this environment that Second World opens its proverbial doors, brimming with comprehensive arrangements of gothic metal and doom. “Havoc” opens the record with aural illusions of a crackling fire and windswept landscapes. The Foreshadowing plunges into the murk with a cyclic lead and the rhythm builds to an antagonistic slog. The pace gears up and Second World is underway with an anthemic quality, as though the new ground is worth celebrating. With the pungent smoke settling and the true Second World on the horizon, The Foreshadowing wisely ends with “Friends of Pain.” The track features smooth atmospherics and Benevento’s haunting tones, providing a theatrical close to the recording. For the band, Second World is a bold statement and a step in the right direction. It is a sonically stirring album, one of depth that concludes a chronicle that is at turns lovely and impressive in its ambition.